I was on the highway today and am almost positive that I saw North Fork Express bus 1806! I'm guessing there is an 1805 too. I can see why they sold some buses. I'm not sure if they sold them so much as traded them in for the newer buses. One more update that I saw 2 day ago, sorry. 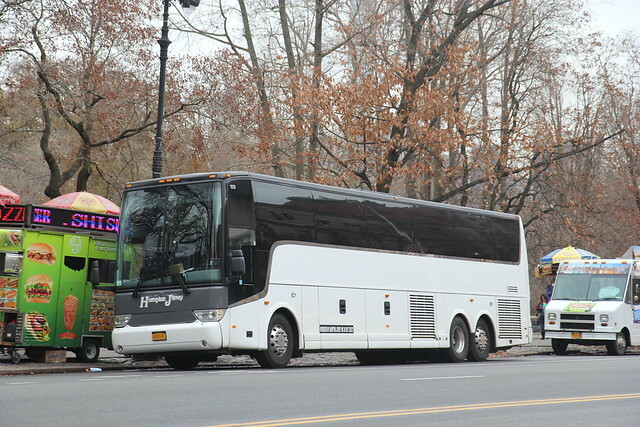 North Fork Express has a 2018 Vanhool cx45 numbered 1807. This bus is wrapped for SUNY Stony Brook. I like that they are trading in buses to keep their fleet current. I wouldn't say their fleet is exactly current. They seem to have quite a few older MCI's still running around. So, I recently rode with North Fork Express and had 1805. This now confirms that they bought 7 2018 Vanhool CX-45's numbered 1801-1807. These are very nice buses and they look very nice with the North Fork Express exterior. Hampton Jitney #159 is a Van Hool TX45. Spotted it yesterday in front of the American Museum of Natural History. Looks like a recent purchase, as it has only the front panel in HJ grey, the rest of the bus is white.